Bare Hill Correctional Facility is located in Franklin County New York. It is a medium security correctional facility that houses adult males. The capacity for this prison is 1,722 inmates. Inmates incarcerated here can receive alcohol and substance abuse treatment. 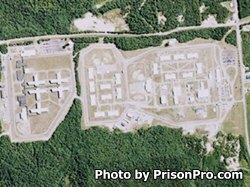 Bare Hill Correctional Facility offers vocational training for inmates in masonry, welding, small engine repair, flooring, horticulture, electrical, computer technology, building and custodial maintenance, and general business (which offers skills for working in a business office). Visiting days will depend on the last number of the inmate's DIN. Inmates with a last digit 0,1,2,3,4 will have visits on Saturdays, inmates with a last digit 5,6,7,8,9 will have visits on Sundays. This rotates every weekend so you will need to call for the current rotation schedule. Visiting occurs from 7:30am-3pm (processing ends at 2pm). The maximum number of visitors is three adult and one small child.